Governor Wolf presented his 2018-19 budget request on Tuesday, and I look forward to carefully studying the $33.2 billion proposal as a member of the Senate Appropriations Committee over the next few weeks. On the surface, the proposal seems like a good starting point. While I am opposed to the Governor’s proposed cuts to tourism and veterans programs, I support the Governor’s proposal to combat Lyme disease in the Commonwealth. I applaud the Governor’s proposed funding for Career and Technical Education. One of my priorities as a member of the Legislature has been to bring new businesses into Pennsylvania and to foster family sustaining jobs, and training people to fill those jobs is a necessary component to achieving job growth and economic success. Over the last few years, I’ve dedicated significant time toward working to create a full-day Career and Technical Education program in the 40th Senate District, and we are very close to accomplishing this goal. It is important that we continue to change and modernize our education system to meet our community and economic needs here in Pennsylvania. Other key funding areas require scrutiny, including the Governor’s proposed funding for education. I’m very pleased to see the continued support for basic education funding and higher education funding, including an increase for the PA State System of Higher Education. However, I’m disappointed that the he kept community colleges level-funded at a time when investing in such programs is as crucial as ever. I would also like to see the Governor have a change of heart on his proposed cuts to health-related programs like cancer research. The Senate Appropriations Committee will begin three weeks of budget hearings on February 20. The hearings provide an opportunity to hear cabinet secretaries and other administration officials detail their plans for the upcoming fiscal year. The current fiscal year ends June 30. I will provide weekly budget hearing updates via this e-newsletter. On this month’s episode of Legislative Report, I had the pleasure of interviewing Michele Baehr, Executive Director of American Red Cross Pocono Mountains Chapter, where we discussed the critical work of the Red Cross and its many committed volunteers. We have an incredibly giving community and nowhere is that more apparent than when friends and neighbors step forward to make a difference in the lives of others in need through the Red Cross. Red Cross mobilizes to help those in crisis throughout our region. Last year alone, our local Red Cross helped 50 families (165 people) displaced by fire. If you do not have a smoke alarm installed in your home, please contact Red Cross and they will install a brand new smoke detector with a 10 year battery life for free. When a family installs smoke detectors throughout their home, it cuts the risk of death by 50 percent. This segment also features information about the upcoming Annual Red Cross Telethon at ESU on Sunday, March 4 from 3 p.m. to 8 p.m.. Make sure to tune in on Blue Ridge Channel 13 or via live stream on social media! Veterans service hours are now offered at both of my district offices in Pen Argyl and Tannersville. This service is offered in Pen Argyl on the third Wednesday of each month and in Tannersville on the second Tuesday. Tannersville District Office: Tuesday, February 13 from 10 a.m. to 2 p.m. (2989 Route 611, Suite 103, Tannersville, PA). Please call 570-620-4326 to schedule an appointment. 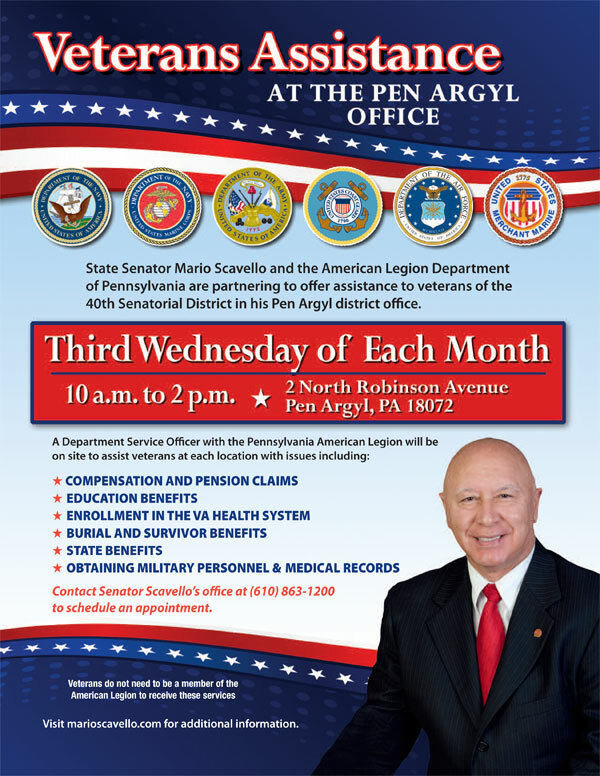 Pen Argyl District Office: Wednesday, February 21 from 10 a.m. to 2 p.m. (2 N. Robinson Avenue, Pen Argyl, PA). Please call 610-863-1200 to schedule an appointment. Veterans do not need to be a member of the American Legion to receive these services. I am excited to announce that I will be opening a new satellite office at the Upper Mount Bethel Township Municipal Building (347 Ye Olde Highway, Mount Bethel, PA) beginning on Monday, March 5. This office will help meet the needs of constituents throughout the areas of Portland, Mount Bethel, Bangor and even Delaware Water Gap who need assistance with any state-related issues. The satellite office will be open Mondays, Wednesdays and Fridays from 8:30 a.m. to 1 p.m. in the township building. We look forward to this new venture and developing new partnerships to better serve the Slate Belt area. If you have any questions or would like further information, please contact me at mscavello@pasen.gov. 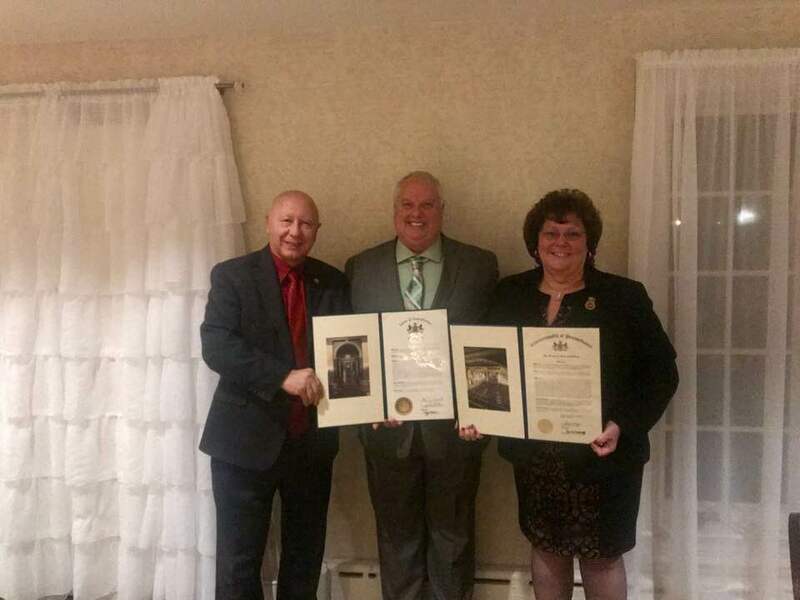 A special congratulations to Timm Tenges who is retiring after 31 years of service as Township Manager for Lower Nazareth Township. Thank you, Timm, for faithfully serving the residents of the township and we wish you all the best in your future endeavors. Legislation increasing government transparency and cracking down on violations of the state Lobbying Disclosure Act received final legislative approval this week and was sent to the Governor for enactment into law. House Bill 1175 increases the maximum penalty imposed by the Ethics Commission for violations of the Lobbying Disclosure Act from $2,000 to $4,000. The bill increases the maximum administrative penalty for negligent failure to report from $50 per-day to $50 per-day for the first 10 days, $100 per-day for days 11 – 20 and $200 per-day after 20 days. The bill improves the current electronic filing system for lobbyists by requiring all filings to be posted on the Department of State’s publicly accessible website within seven days of receipt. House Bill 359 addresses penalties for hunters who mistakenly kill an animal. Senate Bill 894 renames roads and bridges. House Bill 1602 renames several bridges. The Senate approved legislation this week addressing a state Supreme Court ruling that – if not corrected – could require more than 10,000 sexual offenders to be removed from the state sexual offender registry. The Supreme Court ruled in Commonwealth v. Muniz that the state sexual offender registration act, commonly known as Megan’s Law or the Adam Walsh Act, could not be applied to defendants who committed their crimes before the enactment of the Adam Walsh Act in 2012 based on both the U.S. Constitution and the Pennsylvania Constitution. House Bill 631 makes the registration and reporting requirements less onerous by permitting offenders whose offenses occurred before the Adam Walsh Act to petition the court for relief from those requirements. Senate Bill 21 promotes the employment of people with disabilities. Senate Resolution 226 requires the Legislative Budget and Finance Committee to conduct an independent performance evaluation of the largest statewide environmental permitting programs administered by the Department of Environmental Protection. Senate Resolution 253 calls on Congress to amend the Gun Control Act of 1968 to protect the gun rights of medical cannabis users. Senate Bill 796 exempts CDL licensees from the change of address fees if they have not actually moved from their home and the change of address is due to a governmental action beyond their control. Senate Bill 955 establishes a pilot program providing grants to community colleges to partner with secondary schools to train students in fire services. The Senate Judiciary Committee approved House Bill 1952 on Monday. The bill addresses a state Pennsylvania Supreme Court decision that impacts Pennsylvania’s sexual offender registration act. The Senate Appropriations Committee begins three weeks of budget hearings on Tuesday, February 20. You can watch them live at PASenateGOP.com.